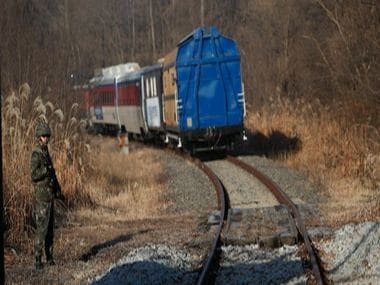 Seoul: A train carrying South Korean engineers and officials crossed into the North on Friday to begin a landmark joint survey to reconnect railway tracks between the two Koreas. Linking up the railway systems was one of the agreements made earlier this year in a key meeting between North Korean leader Kim Jong-un and the South’s President Moon Jae-in. TV footage on Friday showed a red, white and blue train — displaying a banner reading “Iron Horse is now running toward the era of peace and prosperity” — pull away from the South’s Dorasan station, the nearest terminal from the western part of the inter-Korean border. When it arrives at Panmun Station — the first North Korean terminal across the border — the six carriages will be linked up to a North Korean train, and the South Korean locomotive will return home. The South Koreans and their counterparts will live in the train, inspecting two railway lines for a total of 18 days — one linking the North’s southernmost Kaesong City to Sinuiju City near the Chinese border, and the other connecting Mount Kumgang near the inter-Korean border to Tumen River bordering Russia in the east. Seoul said the survey was purely aimed at gathering information on the current state of the North’s rail system and assured that actual restoration works would come only after consents from the UN. The South’s Unification Ministry has earmarked some 63.4 billion won ($56.6 million) for next year on the assumption that it will take five years to repair and improve the two railway routes in the North. The North’s leader Kim Jong Un, during a summit with the South’s President Moon Jae-in in April, said the North’s railway infrastructures are “embarrassingly” dilapidated, praising the South’s high-speed railway system. The North’s railway tracks are in such disrepair that trains reportedly operate between 20-45 km per hour. The South’s dovish President Moon has long favoured engagement with the nuclear-armed North and has dangled large investment and joint cross-border projects as incentives for steps towards denuclearisation.